There are many smart phones in the market which are very costly but do not provide specifications upto the prices. Samsung has launched Galaxy S6 edge in April 2015 which is cost effective and has all the features you will love to use. Samsung galaxy S6 Edge price stands at Rs. 42,650 at online store India Times which is lowest for 6 January 2016. The phone price ranges from Rs. 42650 to Rs. 46600. Different sellers sell the phone at different prices on the online stores. The pricing of the phone has seen a little up and down over the time but the phone prices were this low before. India Times sells this phone at 8% lower price than PayTM which sells it at Rs. 46600. 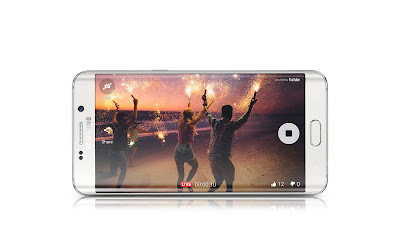 Camera: Samsung galaxy S6 Edge has abrilliant camera of 16MP with all the professional digital camera features. You can take a picture with panorama view. It has auto focus, touch focus, LED flash, HD recording, geo tagging as well as face detection functionality. Delightful features: Samsung has given some amazing features in the phone which make it beloved. The phone has air gesture recognition system. It has a lot of sensors which make it even more beloved. It can scan your finger print on its display. The phone has proximity sensor, gyro, compass, SpO2 and accelerometer sensors. You can even check your heart rate with its heart rate sensor. Battery: The most amazing feature of the phone is its wireless charging functionality. It has a non removable Lithium ion battery of 2600 mAh. The battery backup is marvelous to give you a more delightful experience of the phone features. Connectivity: The phone can be connected via Bluetooth, NFC, USB and Wi-Fi. It has Wi-Fi 802.11 a/b/g/n/ac, dual band together with Wi-Fi direct and Wi-Fi hotspot functions. The Bluetooth version is latest in the phone which is v4.1, A2DP, LE, apt-X. The GPS of the phone works excellently and gives you a more directed navigation at your tours.